A fully swimmable, fishable, healthy Narragansett Bay, accessible to all. That’s what Save The Bay® – Narragansett Bay and our many supporters, volunteers and partners have been working toward since 1970. From humble but passionate beginnings as a tiny grassroots organization opposing a proposed nuclear power plant at North Kingstown, Rhode Island’s Rome Point in 1970, Save The Bay has grown into the state’s largest, member-driven, non-profit organization advocating for Narragansett Bay. Today, we operate a fleet of three vessels to give students and community members close-up experiences with their Bay. We’ve been selected to participate in a White House Summit on environmental education, and our education programs serve 15,000 K-12 students and teachers each year. Our members have helped us successfully defeat a proposed LNG facility, and pass legislation to increase protections for coastal wetlands from development and eliminate Rhode Island’s cesspools. We now organize the International Coastal Cleanup for Rhode Island and run the state’s only hands-on aquarium featuring local marine life exclusively. 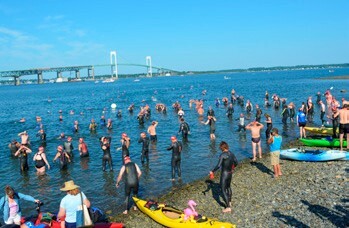 And we just held our 39th Annual Save The Bay Swim, a storied open-water swim and our signature fund raising event. Once choked by raw sewage and dying a slow death from industrial toxins, the Bay is now making a strong comeback. More than ever before, people are able to swim, fish, sail and enjoy the waters of Narragansett Bay. But there is still work to be done before our vision is fully realized. We’re connecting our community to the Bay and its inhabitants through education, eco-tourism, and restoration programs, and continuing to advocate for laws and regulations to protect the Bay for years to come. Since our beginnings, advocacy has been the heart of Save The Bay. Our advocacy work today includes monitoring water quality, identifying pollution sources, holding state environmental agencies accountable for enforcement of federal law and promoting policy changes to improve Bay health, increase public access and adapt to changing climate conditions. Out on the water, our Baykeeper and Coastkeeper act as the eyes, ears and voice for our local waters. An incredible team of restoration ecologists and volunteers plan, lead, manage and participate in projects that limit the impacts of rising sea level, changing precipitation and increasing storm intensity on our coastal watersheds, salt marshes, beaches and dunes. We plant beach grasses to prevent beach erosion, dig creeks in salt marshes to drain trapped water, retrofit the ends of dead-end roads to filter polluted runoff, remove dams and install fish ladders and much more. The continued improvement of Narragansett Bay for the next 45 years depends on the next generation of Bay stewards. In partnership with school districts, private schools and individual teachers, Save The Bay reaches about 15,000 students with hands-on marine science and environmental education every school year, while summer BayCamps give about 350 K-12 children hands-on, adventure-filled experiences on and along the Bay. For our community members, lighthouse tours in summer and fall offer a unique vantage point from the water, while winter birding and seal tours prove that summertime isn’t the only time to enjoy the Bay. Some 22,000 visitors per year get close-up with the marine life of Narragansett Bay at our Exploration Center and Aquarium on Easton’s Beach in Newport, where three touch tanks and a more than two dozen living exhibits showcase 50+ species and 100+ animals at any given time. Thousands of volunteers help us clean up Rhode Island’s beaches and shorelines by picking up debris at more than 100 cleanups every year. The International Coastal Cleanup in September is a great way to discover the role that humans can play in the health of our waters and marine life. You can support our work and Narragansett Bay by becoming a member of Save The Bay. For more information, visit savebay.org. To join, visit savebay.org/membership. Cindy M. Sabato, APR is Save the Bay’s Director of Communications.